Originally named to the 2007 list of Texas’Most Endangered Historic Places, the railroad is designated as saved on the 2013 list. The Texas State Railroad (TSRR), designated the “official railroad of Texas” by the Texas Legislature, is recognized as one of the nation’s largest and most unique steam train operations The Railroad began in the 1880s as a way to deliver pig iron produced by the prison located in Rusk. It was converted to a heritage railroad attraction in 1976 by the Legislature and became a major tourist attraction. However, it was scheduled to become a static display when the Legislature refused to fund its operation, and the local community had almost exhausted its financial resources. In 2007 management of the TSRR was privatized with a contract with American Heritage Railways. In conjunction with this, the state formed the Texas State Railroad Authority, to oversee the railroad and to ensure that this Texas treasure continues to function as it always has. The TSRR Authority board is comprised of members from both Rusk and Palestine, where the two depots are located. The members of this board are passionate about the railroad, and not only its continued existence, but that it also evolve with the times and grow and flourish. In August of 2012 American Heritage Railways sold the Texas State Railroad to Iowa Pacific Holdings. In addition to continuing passenger operations, Iowa Pacific Holdings re-opened the track to the main line in Palestine in November 2012 and is now able to offer freight services. 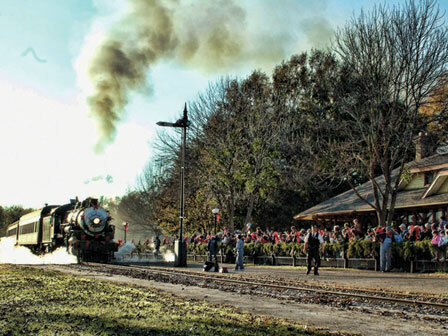 In 2012, the Texas State Railroad hosted more than 52,000 riders, with more than 43,000 of them riding during the The Polar Express™ Train Ride special event, which occurs in November and December. Riders came from 35 states and three countries. The state’s decision to privatize the railroad and to create a quasi-governmental governing body in the form of the Texas State Railroad Authority Board was the turning point in preserving the site.